My kids love meatballs, as do most kids I know. So I had to try this recipe once I saw it. 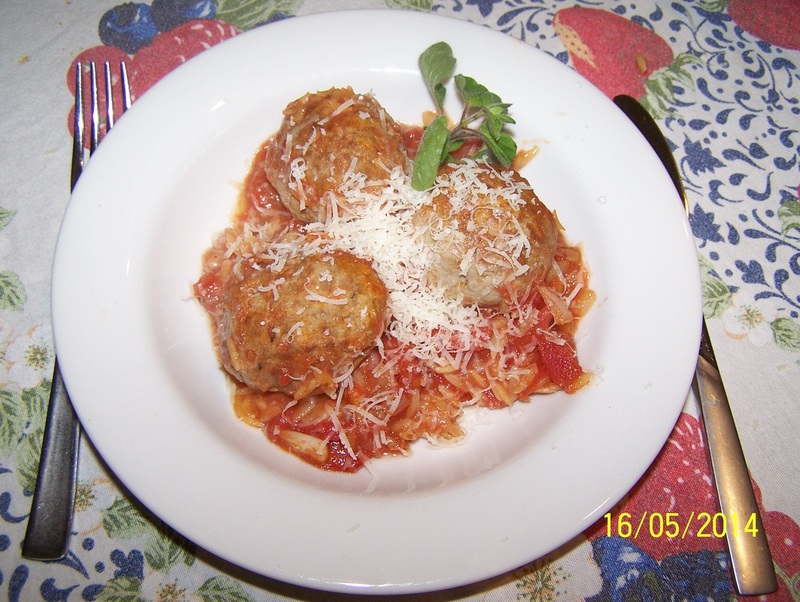 It was lovely, the meatballs were nice and moist and the cheese had melted perfectly in the centre. The sauce had a great flavour. My only criticism is that the risoni gets lost in the sauce. You can't actually taste them. So I am posting the recipe as it is lovely and well worth the try. However next time I will either make a little extra spaghetti on the side, as I like to taste the pasta with the sauce or I will try adding small spiral pasta instead. But it was a lovely dish, and it did taste great. I just need to have more pasta with it. Once I have tried my alternatives, I will post the changes so you know if it works. But try it anyway as it was a hit with my family. Cut mozzarella into 16 equal pieces. In a small food processor add enough bread, crusts removed, to make 1 cup crumbs. Remove the leaves from 2 sprigs of rosemary and add it to the bread, along with the oregano and garlic. Blitz until all is finely chopped and you have breadcrumbs. In a large bowl add the mince, 3/4 of your breadcrumb mix, vegeta and the eggs. Season with salt and pepper. Using your hands mix it all together well. The mixture needs to be moist but not wet, so add more breadcrumbs if your mixture is too wet. But if it feels right don't add the remaining breadcrumbs as it will make your meatballs dry and hard. Using a 1/4 cup measuring cup. Shape 1/4 cup mince mixture into a ball. Flatten out to form a disc. Place 1 piece of the cheese into the centre of the mince. Shape the mince into a ball to enclose the cheese. Make sure there are no gaps in the mince or your cheese will melt out. Place on a baking paper lined baking tray. Repeat until you have 16 large meatballs. Refrigerate for at least 30 minutes or until needed. Preheat the oven to 190C/170C fan forced. Heat 1 tablespoon of the oil in a large ovenproof frying pan or roasting pan over medium high heat. Cook the meatballs, turning, for 6 minutes or until browned all over. Transfer to a plate. Using the same pan, add the remaining oil. Add the onion, cook, stirring for 5 minutes, or until softened. Add the remaining rosemary sprig, stock and tomatoes. Bring to the boil. Stir in the risoni. Season with salt and pepper. Return the meatballs to the pan. Bake for 25-30 minutes, turning the meatballs after 15 minutes of cooking. Bake until your meatballs are cooked and the risoni is tender. Discard rosemary sprig, serve sprinkled with grated parmesan and oregano.